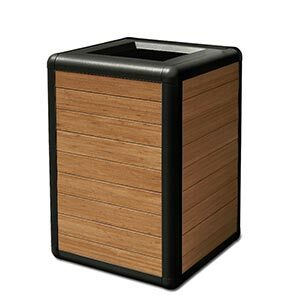 Complement the natural characteristics of facility spaces with contemporary Bamboo Beacon Hill receptacles. These 45 gallon square receptacles are eloquently designed utilizing mature exterior grade bamboo planks supported by a durable extruded powder-coated aluminum frame. The ultra-resilient bamboo planks have a superior hardness rating compared to teak and are engineered with V.O.C adhesives, finished with a clear UV-resistant stain. Great for an array of applications, eco-friendly Beacon Hill bamboo receptacles feature material specific protective finishes, rubberized adjustable leveling feet and pre-drilled holes for portable or surface installations. 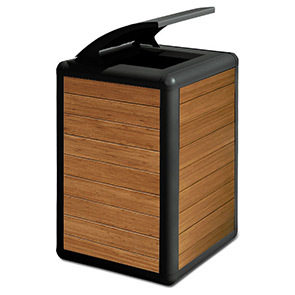 Beacon Hill Series receptacles accommodate a built-in tapered bonnet top or open top lid providing a 12.5" trash disposal opening with convenient lift-off access for easy servicing of the included high-density plastic liner.